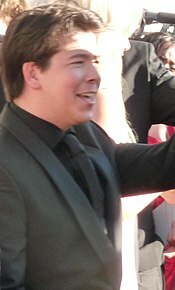 For other people named Michael McIntyre, see Michael McIntyre (disambiguation). from the BBC programme Desert Island Discs, 17 July 2011. Michael Hazen James McIntyre (born 21 February 1976) is an English comedian, writer, and television presenter. In 2012, he was the highest-grossing stand-up comedian in the world. In addition to stand-up, McIntyre has hosted his own BBC One comedy programme Michael McIntyre's Comedy Roadshow, has featured in three episodes of Live at the Apollo and, in 2011, was a judge on Britain's Got Talent. He currently presents his own Saturday night series Michael McIntyre's Big Show on BBC One. McIntyre resides in Hampstead, London with his aromatherapist wife, Kitty, who is a daughter of the late actor Simon Ward and sister of actress Sophie Ward. The couple have two sons, Lucas and Oscar. McIntyre is a supporter of Tottenham Hotspur. McIntyre is also a keen cricket fan and has appeared on Test Match Special to discuss the sport. On 4 June 2018, McIntyre was robbed of a Rolex watch by men on mopeds while parked outside his children's school. McIntyre at the British Academy Television Awards 2009. Aged 13, Michael was in the audience of the BBC One Saturday morning show Going Live! on 1 April 1989, where he appeared on camera asking a question to pop group Five Star. McIntyre has appeared three times on BBC One's Live at the Apollo, in 2007, 2008 and 2009. He has released four DVDs, Live and Laughing, Hello Wembley, Showtime and Happy and Glorious, that have sold a combined total of over five million copies in the UK. McIntyre's many comedy panel show and chat show appearances include Chris Moyles' Quiz Night, Mock the Week, 8 out of 10 Cats, Have I Got News for You, The Big Fat Quiz of the Year, Would I Lie To You?, The Apprentice: You're Fired!, Alan Carr: Chatty Man and Friday Night with Jonathan Ross. From 6 June 2009, McIntyre began hosting Michael McIntyre's Comedy Roadshow, which aired Saturday nights on BBC One. On 5 July 2009, McIntyre appeared on the BBC show Top Gear as the "star in a reasonably priced car", driving around the Top Gear test track in one minute and 48.7 seconds. During his lap of the track he almost rolled the car while going around the final corner; but his hair was kempt. On 31 March 2010, McIntyre took part in Channel 4's Comedy Gala, a benefit show held in aid of Great Ormond Street Hospital, filmed live at London's O2 Arena. He also appeared on the year's edition of The Big Fat Quiz of the Year on Channel 4, where he was partnered with Alan Carr. On 14 December 2010, it was announced that McIntyre would join the ITV talent show Britain's Got Talent as a judge in 2011 with David Hasselhoff and Amanda Holden. McIntyre and Hasselhoff replaced Piers Morgan and Simon Cowell, although Cowell returned for the live shows. Following the series, McIntyre announced that he would be leaving the show after appearing for one series. In 2010 and 2014, McIntyre hosted the Royal Variety Performance on ITV. He also previously performed on the show twice: in 2006 and 2008. McIntyre co-hosted various segments of Comic Relief in 2011 and 2013 on BBC One. On Christmas Day 2011, McIntyre hosted a Christmas Special edition of Michael McIntyre's Comedy Roadshow. The show was watched by 8.1 million viewers. In 2014 McIntyre fronted his own BBC One talk programme, The Michael McIntyre Chat Show. A Christmas special aired on Christmas Day in 2014. On 5 April 2015, Michael presented Michael McIntyre Presents...Easter Night at the Coliseum, a one-off special for BBC One. In November 2015, it was announced that McIntyre would return to BBC One for Michael McIntyre's Big Christmas Show. The show was recorded in front of a live audience in the Theatre Royal in London before airing on Christmas Day. Since April 2016, McIntyre has presented Michael McIntyre's Big Show, a Saturday night entertainment series for BBC One. A second series began airing in November 2016. A third series began airing in November 2017. McIntyre has performed three times on the Royal Variety Performance, including in 2010 when he became the youngest ever host. In 2009, McIntyre performed for an estimated total of 500,000 people on his first tour of the United Kingdom that included a record-breaking six nights at Wembley Arena and four at The O2 Arena. In 2012, his UK tour included 71 arena dates, playing to over 700,000 people, including a record breaking 10 nights at the O2 Arena in London. According to ticket sales company Pollstar the tour helped make McIntyre the world's biggest selling comedian in 2012, bringing in around £21m. On 20 April 2013 McIntyre played the biggest comedy gig in Africa to 9,000 fans at the Coca-Cola Dome in Johannesburg. In 2015, McIntyre toured the UK and Ireland with his "Happy & Glorious" tour. In February 2016, he took the tour to Norway for two dates, and in October 2016 he took it to Australia for four dates. In 2018 he became the highest selling artist in the history of the O2 Arena, selling over 400,000 tickets over 28 shows, which surpassed the previous record held by Take That. In 2010, McIntyre released his autobiography, Life and Laughing: My Story. ^ "Michael McIntyre". Desert Island Discs. 17 July 2011. BBC Radio 4. Retrieved 18 January 2014. ^ "McIntyre is world's most successful comedian". The Daily Telegraph. London. 25 January 2013. ^ "The Tudors actor Simon Ward dies after long illness". BBC News. ^ Gordon, Bryony (11 November 2012). "Michael McIntyre interview: 'Maybe people just can't cope with how jovial I am'". The Daily Telegraph. telegraph.co.uk. Retrieved 27 June 2016. ^ "Comedian issues Spurs rallying call". BBC. 23 February 2008. Retrieved 20 July 2009. ^ "BBC Radio 5 live sports extra - Test Match Special, 18/07/2013, The Ashes: Michael McIntyre joins TMS". BBC. ^ "Michael McIntyre robbed by men on moped". BBC. 5 June 2018. Retrieved 5 June 2018. ^ Evans, Mel (5 June 2018). "Michael McIntyre forced to hand knife-wielding robber £15,000 watch in shocking daylight robbery". Metro. Retrieved 5 June 2018. ^ Cox, Gordon (15 November 2012). "McIntyre: Luring fans for 'Live and Laughing'". Variety. Retrieved 30 July 2013. ^ "New BGT judges revealed!". itv.com. Archived from the original on 13 July 2011. ^ "Michael McIntyre to host The Royal Variety Performance 2014". presscentre. ^ "Downton Abbey overtakes EastEnders in updated Xmas ratings". televisual.com. Retrieved 4 January 2012. ^ "Michael McIntyre lands his own BBC One chatshow". Digital Spy. ^ "Michael McIntyre's Very Christmassy Christmas Show - BBC1 Variety". comedy.co.uk. Retrieved 27 June 2016. ^ "Michael McIntyre's Easter Night at the Coliseum - BBC One". BBC Online. Retrieved 27 June 2016. ^ "Michael McIntyre's Easter Night At The Coliseum - BBC1 Variety". comedy.co.uk. Retrieved 27 June 2016. ^ "BBC - Michael McIntyre's Big Christmas Show returns to BBC One this Christmas - Media Centre". BBC Online. Retrieved 27 June 2016. ^ "Michael McIntyre to host another BBC Christmas special". comedy.co.uk. 10 November 2015. Retrieved 27 June 2016. ^ "Michael McIntyre to host Royal Variety Performance". BBC. Retrieved 25 January 2013. ^ "Michael McIntyre world's best-selling comedian in 2012". www. suchsmallportions.com. Retrieved 8 January 2013. ^ "Desert Island Discs – Michael McIntyre". Bbc.co.uk. 22 July 2011. Retrieved 30 July 2013. ^ Harris, Jogn (13 December 2010). "Why celebrity memoirs rule publishing". The Guardian. Guardian News and Media Limited. Retrieved 17 January 2014. ^ "BBC - Michael McIntyre returns to BBC One this Easter - Media Centre". BBC Online. Retrieved 27 June 2016.